What's A New Jersey Governor To Do? Yes, Abq Jew came very close to saying "Mass" - with reference to the current and ongoing scandal over a 4-day intentional traffic jam in Fort Lee on the approaches to the George Washington Bridge. Abq Jew must point out that there are 5-day traffic jams in Fort Lee on the approaches to the GWB roughly four times every month. But those traffic jams occur naturally, and without the encouragement of the New Jersey Governor's staff. Abq Jew must also say that - apart from the time and energy wasted, the lives and fortunes placed in jeopardy, and the overall meanness suggested by the allegations - this scandal is almost laughable. OK ... it's very laughable. See below. As usual, The New Yorker has this covered. Starting with the cover of the current issue. 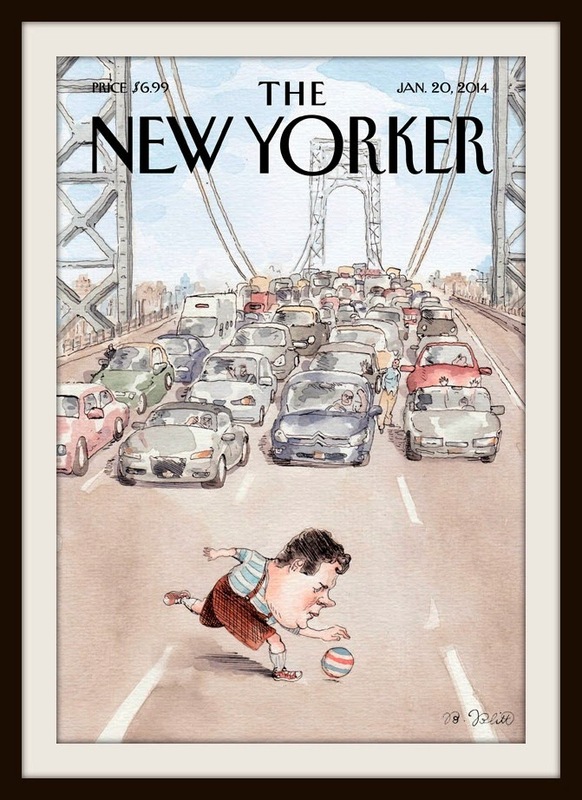 By Barry Blitt; you can visit his website here. “Well! This stage and this moment are very improbable for me.” For twenty-four overwrought minutes, Christie spoke, proudly, glowingly, about the subject that really gets him fired up, which is himself—how he always faces the hard truths; how he wants to be respected more than loved; how, of his two parents, he’s much more like his tough, brutally honest Sicilian mother (“I am her son!”) than like his good-hearted, lovable Irish father. It was later observed that the Governor almost forgot to mention the Party’s Presidential candidate, Mitt Romney, whose nomination Christie was in Tampa to kick off; less widely remarked was that he also practically disowned his sole surviving parent, who was in the audience listening, and presumably didn’t mind. The trouble with Christie has to do with more than ordinary narcissism, which, after all, is practically an entry requirement for a political career. Last September, we now know, Chris Christie’s office, if not the New Jersey governor himself, conspired with the Port Authority to close access lanes to the New Jersey side of the George Washington Bridge, the world’s most heavily trafficked span, apparently out of spite. Schwartz maintains a Top Ten list of New York City’s worst gridlock incidents, dating from a blizzard on March 12, 1888, through Halloween of 2012, two days after Hurricane Sandy. The Christie antics, because they were confined to the Jersey side of the bridge, don’t register on the official Gridlock Sam scale, but Schwartz hears things and, during the mysterious G.W.B. delays last fall, he asked around. When he couldn’t get a straight answer, he assumed that there was a sinkhole on the approach, or some other maintenance mishap that would embarrass the authorities. “I never imagined that it was a deliberate act,” he said. What now for my thesis that Chris Christie, the troubled New Jersey governor and self-described Bruce Springsteen fanatic, isn’t quite ready for the politicians’ slaughterhouse? To say that the Springsteen-Fallon video has gone viral is an understatement. And in case you haven't seen the video yet - Abq Jew is here for you!